« Happily Ever After… thus far, anyways. What to do… What to do…? I think I am suffering from a moderate case of post-marathon blahs. The week after the marathon, I ran three days and made it to the gym two more. Last week…? Not so much. Without a goal, or looming deadline, I just Don’t. See. The. Point. Of course this isn’t true. Working out is good for you! It improves your mood! It strengthens your immune system! It does all sorts of beneficial stuff, especially if one is inclined to chunkiness and happens to own a cookie shop. If that is the case, well, working out should be the very top thing on your list, baby. Word. But, sigh, I can’t quite seem to get myself motivated. Without the regimen of my prescribed training program, I just wander about the gym, halfheartedly thinking, “I don’t know…. Elliptical? Recumbent bike? Free weights?” And then I remember– I hate all that stuff. I don’t even really like running. I just like running harder and farther than I ever have and then going, “Holy smokes! That’s crazy!” The running itself is pretty much torture. It’s the “harder” and “farther” that hooks me. 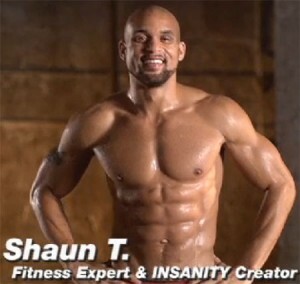 Which is why I am becoming somewhat obsessed with the Insanity infomercial. Plus, you get to work out with this guy…Hel-lo! At first, my son and I would watch the infomercial together. “Nuts.” I’d echo, and there we would sit, watching the participants in the demo workout collapse on the ground, panting and sweating. Once in a while, one of us would get up, to try a certain move -once- and then sit back down, slowly shaking our head. Now hubby has started pausing and watching with me. We’ve discussed my fascination several times now, usually with me listing all the reasons why I can’t do it, (no money, the upper body strength of a veal calf) and him assuring me that it might be perfect for a crazy, oops, dedicated person, such as myself. “Honey,” he insisted, “you could do it. You are fierce. I mean, nobody would look at us that think you are the runner.” Which is just the sort of things husbands say and think are compliments. "upper body strength of a veal calf" just made me snort my ice tea right up my nose. Hilarious. A somewhat graphic, but entirely accurate description, unfortunately.